Ever since Fein's patents on the multitool design ran out, competing manufacturers have been producing their own variants, keen to cash in on potential sales for these versatile devices. A while ago I tried the corded version, so now I thought I ought to try the cordless MultiMaxx to see if it was up to the same performance standard. 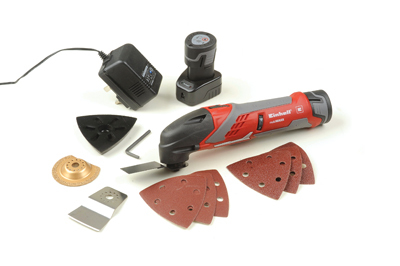 The kit is nicely presented in a blowmould case with a set of basic accessories for a variety of tasks, although Einhell can supply a much wider range of attachments to suit all tasks. The body is compact with 10.8v Li-ion batteries that are even smaller. It has a comfortable rubber overmould, variable speed and a push-forward 'on' button. 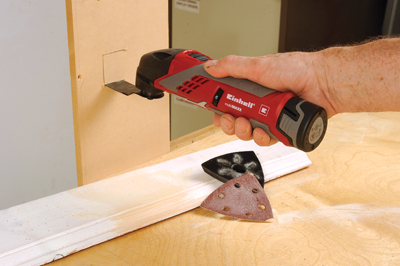 It is a handy tool for site work when you need to cut accurate holes in plasterboard, clean out tile grout, lift bonded carpet or sand into awkward corners. The accessories are fitted using an Allen key and the MultiMaxx will accept other brands' accessories as well. There is no need to apply heavy pressure as it will slow the vibrating action.